Sharon is a Yoga, Pilates and meditation teacher, practicing yoga since 1985. Dedicated to contemporary body and mind education for well-being, she has a good eye and deep understanding of alignment of the body and its energetic fields. 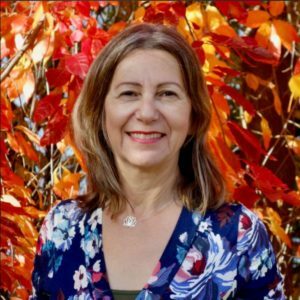 Sharon’s passionate about sharing pathways to healing, happiness and living a holistic healthy life. She integrates scientific and experiential knowledge, while creating an inclusive and welcoming atmosphere for learning and movement re-patterning. Her inclusive and accepting positivity affirms each individual, while enhancing group harmony. She has trained in iRest Yoga Nidra, based on Richard Miller’s research on the neuro-plasticity of the brain to hard wire well-being. Prior training includes study with Iyengar teacher Felicity Green, TKV and Menaka Desikachar, Donna Fahri and Leila Stuart. Sharon’s work for Physical Therapist, Suzanne Lynch has expanded her physiological knowledge and observational skills, that she simply and eagerly shares. Since 2014, she has developed the yoga program for the Multiple Sclerosis Centre at Swedish Neuroscience Institute, Seattle. Sharon developed Yogawalks which combines Yoga, walking, breath, posture, meditation and mental chanting to easily integrate healthy habits into daily life. • Led the Yoga program for Unitec Contemporary Dance and Performing Arts School from 1990 – 2000. • With Becca Wood, she is the co-founder of Yogaworks that offers classes, privates and workshops in Auckland. • Teaches Gentle Yoga and Well-Being for those with MS, Parkinson’s and other neurological disorders for the Swedish Hospital Multiple Sclerosis Centre, Seattle, USA. • Incorporating her skills as a certified Pilates instructor she assists Suzanne Lynch, a leading rehabilitative physical therapist at Sol PT, Seattle.